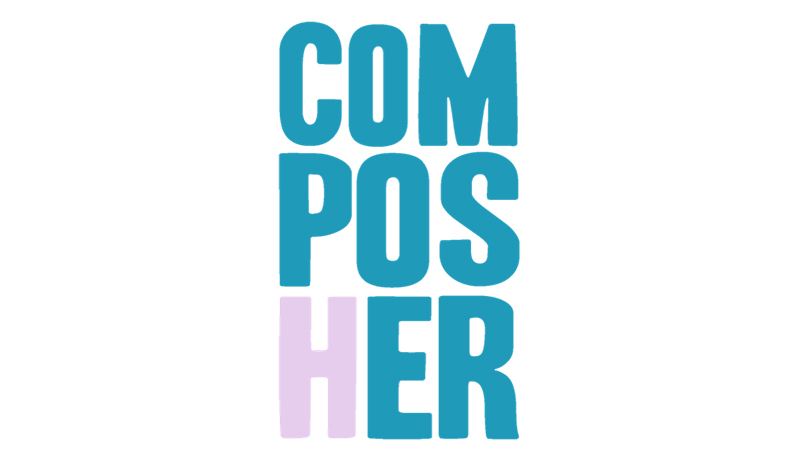 ComposHER is a new concert celebrating the best new music to moving picture, featuring a stunning roster of some of the best women composers writing for the screen today. The aim of the concert is not only to showcase this incredible talent in the UK, of composers scoring film, TV and more, but also to inspire the next generation of women composers and to seek to make this area of the industry as inclusive as possible for future generations. With composition being one of the most unequal areas of the global music industry, much work to tackle this has already taken place: 2018 saw the launch of the UK Women Composers’ Forum, as well as a new global database of women composers writing for visual media on FreeTheBid.com. This concert seeks to continue to support and empower the UK women composers’ community, towards further progression and change in 2019. Many of the performances will be introduced or accompanied by the composers, with the 2 hour concert separated into two halves of music performed from all areas of visual media, to encompass the diverse nature of the British industry, showcasing works for film, TV, theatre and video games. The musical genres of the performances will also vary to feature classical composition, vocal performance alternative & electronic music and ensemble performances, played by the London Contemporary Orchestra. The composers being showcased are: Carly Paradis, Jessica Jones (selected by the NFTS to represent their alumni), Anne Nikitin, Emilie Levienaise-Farrouch, Kate Simko, Jessica Curry, Jocelyn Pook, Nainita Desai, Imogen Heap (music performed by LCO and SHE Choir), Alev Lenz, Claire M Singer and Amelia Warner. Jessica Curry is a BAFTA-winning composer of contemporary classical music. Her work has been performed in diverse and high-profile venues around the world from The Barbican to Sydney Opera House, The Royal Albert Hall to MOMI in New York. Jessica presents High Score on ClassicFM, a show dedicated to the best video game music. Jessica is currently London Oriana Choir’s composer in residence and her innovative new piece ‘She Who’, commissioned by NYCGB, is one of 19 new works selected for PRSF’s 2019 New Music Biennial. Nainita Desai is a BAFTA BREAKTHROUGH BRIT 2016-17 and a recent winner of the Music+Sound Award for Best Feature Film Score, a Women in Sync Awards 2016 Nominee, RTS Craft Award 2014 Nominee for Best Original Music and RTS Scotland Awards 2014.Working at the forefront of a new wave of emerging artists, Nainita recently scored two features; the BFI psychological horror Darkness Visible (Dir: Neil Biswas, co-creator of Sky 1 Lucky Man), and WW2 thriller Ni’ihau, filmed at Pinewood Malaysia. Her latest projects are the features 5 Years in Love And War (C4) by Emmy award winner Ed Watts, Untamed Romania, the most successful non-fiction film ever released in Romania that world premiered at Transylvania Film Festival 2018, The Life After (BBC / Irish Film Board) world premiering at Galway Intl Film Festival 2018, dramas Anemone (BBC Film | Film London), Exit Eve, exec prod: Camille Gatin (The Girl With All the Gifts), and Interactive movie / video game Telling Lies for Annapurna Interactive (Phantom Thread, Zero Dark Thirty) and multi-Bafta winning director Sam Barlow.Also known for her work on dramas including Emmy winner Maxwell (BBC) and the factual drama To Kidnap A Princess (ITV), recent projects include The Confessions of Thomas Quick (BFI/Film4), Bafta 2018 Nominees Raped: My Story and Catching A Killer(C4), landmark series Extraordinary Rituals and Earth’s Natural Wonders for the BBC NHU and the prestigious BBC Royal Wedding Meghan and Harry title theme. Jessica is a London based composer for film and television. She studied violin and composition at the Royal Conservatoire of Scotland, during which time she won a BAFTA New Talent award, before going on to the National Film and Television School. She recently scored ‘Joanna Lumley's Silk Road Adventure' and BBCs 'Abused by my Girlfriend’ as well as Royal Television Society nominated ‘The Ruth Ellis Files’. As part of the scoring team she has worked on studio features such as ‘Darkest Hour’, ‘Paddington 2’ and ‘Bumblebee’. Jessica performs with Tim Morrish as part of the duo Vanbur and as a vocalist has also featured on various scores including 'The Good Karma Hospital', 'Thunderbirds are Go' and 'The A List'. In 2016 she co-founded AUDIUM POST, an award winning sound and music post production company who’s clients include Reebok, Mercedes, Bose, BMW, Barbour and New Look amongst others. Imogen Heap is an English singer, songwriter, record producer and audio engineer. Born in the London Borough of Havering, Heap became classically trained in piano, cello and clarinet at a young age. She began writing songs at the age of 13 and, while attending boarding school, taught herself both guitar and drums, as well as music production on Atari computers. Alev Lenz is a remarkable singer, songwriter and composer whose music fuses filmic, world and classical influences into her unique brand of sophisticated pop music. Those who have listened to Alev before will recognise her bittersweet voice and utterly personal lyrics, loaded with melodic flavours and inspiring hooks that take you by surprise, and deep and compelling song structures, stemming from a diverse set of influences in her music, from European classical to experimental electronics. Since the release of her debut album "Storytelling Piano Playing Fräulein" back in 2009, in her home country of Germany, Alev has kept herself busy with gigs in London, New York and across Germany and Turkey, as well as lending songs to and composing for several high profile German and Austrian films. For her second studio album 'Two-Headed Girl', Alev enlisted the services of acclaimed Finnish drummer, Samuli Kosminen (Múm, Hauschka, Kronos Quartet), completed by the mixing skills of Jas Shaw (Simian Mobile Disco). For her third album '3', Jas Shaw was once again her sonic partner and mixed what is not only Alev’s third album; it was also three years in the making. Three years in which Alev Lenz also sang and co-wrote the title track of Anoushka Shankar's Grammy-nominated album "Land of Gold", and wrote and sang her breakthrough track "Fall Into Me" from Netflix's "Black Mirror“. Emilie Levienaise-Farrouch is an award-winning French pianist/composer living in London. In 2006 Emilie moved from Bordeaux to carry out a BA in music at Westminster University, then a Master’s degree in composition at Goldsmiths with a primary focus on contemporary classical music. Spanning film score, bespoke composition and sound design, her work is connected both by its evocative and meticulous craft. Emilie scored her first feature-length film in 2012: (American-Iranian director Caveh Zahedi’s ‘The Sheik and I’) and in 2018 scored Harry Wootliff’s debut feature ‘Only You’ which premiered in the BFI London Film Festival. Her CV also includes commissions for the V&A Museum (London), HBO short film ‘Love NY’, and for drama / documentaries on BBC Radio 4, The Guardian, Funny or Die. In 2013 she received the Emerging Excellence Award from the Musician Benevolent Fund, and in 2015 was commissioned to create a sound-walk for London’s Queen Elizabeth Olympic Park. She has also worked on multiple projects in collaboration with visual artists Danica Dakic, Alice May Williams and Natasha Caruana. She has created music for video installations exhibited at Jerwood Project Space, Speke Hall, The ODI, Arles Photo Festival; and also, for VR installations for HOUSE Biennal. As a live performer she has played Tallinn Music Week, Brighton Festival and the Union Chapel. In 2017, she was commissioned by The London Contemporary Orchestra to write a piece for small string ensemble and live electronics, which received a premiere during the 2017 BBC Proms at The Tanks at Tate Modern. Emilie’s debut album, ‘Like Water Through the Sand’ was released on 130701 in November 2015, with her second album ‘Epoques’ following in Summer 2018. Royal Television Society nominated Carly Paradis (Canadian born) is a film and TV composer, songwriter and pianist, whose credits include sole composer of RTS winning and BAFTA nominated series Line of Duty for BBC, Netflix original The Innocents (2018) which she won a Hollywood Music in Media Award for original song, Sky Atlantic’s Sick Note (Rupert Grint, Nick Frost, Don Johnson) and PBS Masterpiece/ITV’s Prime Suspect 1973 (prequel to Prime Suspect). She wrote the original score for Jed Mercurio’s feature length BBC adaption of Lady Chatterly’s Lover, and her music has been used in trailers for True Detective, Homeland and Martin Scorsese’s Hugo. Kate Simko has carved an international career as an electronic music producer, film composer, live performer, and DJ. Hailing from Chicago, Kate’s music reflects the influences of the city’s underground sounds, as well her background in classical piano and film music. Kate graduated from the Royal College of Music in London in 2014 with a Masters in Composition for Screen and received her Bachelors in Music Technology from Northwestern University. While at Northwestern, Kate began DJ’ing on WNUR, and oversaw the electronic music format at the station, and scored her first film. Upon graduation, Kate moved to Los Angeles where she worked with Academy Award winning sound designer Stephen Flick, gaining her first experience in feature films. She has released multiple albums and soundtracks, reaching the Top 100 in the Billboard Classical chart, as well as the Top 10 in house music charts worldwide. Her music has been licensed by ABC Television, Victorinox, and Giorgio Armani, and she has written original music for films, commercials, iPhone apps, and shows on the BBC, Netflix, and PBS. Claire M Singer is a composer, producer and performer of acoustic and electronic music, film and installations. In recent years her work has focused on a mix of organ, cello and electronics and her debut album Solas was released on Touch in June 2016 followed by her second release Fairge in October 2017. Performances and commissions include Tate Modern London; Fylkingen Institute Stockholm; Ceremony Hall Austin, TX; Muziekgebouw Aan' t ij Amsterdam, Oude Kerk Amsterdam and the Barbican London.